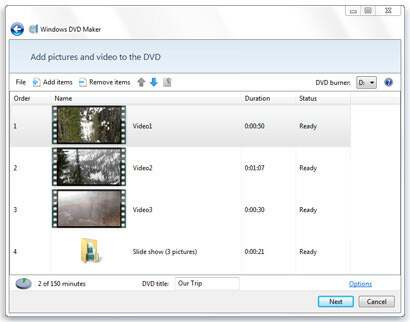 Windows DVD Maker is a feature you can use to make DVDs that you can watch on a computer or on a TV using a regular DVD player. The quickest way to make a DVD is to add pictures and videos in Windows DVD Maker, and then burn your DVD. If you want to get creative, you can customize the DVD menu style and text before you burn the DVD. Windows DVD Maker Guide - Windows DVD Maker application available in Windows Vista and Windows 7 Operating systems. If you need more information please contact the developers of Windows DVD Maker (Microsoft Corporation), or check out their product website.